Welcome to the BSA Owners' Club of New England and the Annual British Motorcycle Meet website. Founded in 1978 by BSA motorcyclce enthusiasts from the Boston area, the BSAOCNE includes members from throughout New England. We're also the sponsors of the Annual British Motorcycle Meet™. 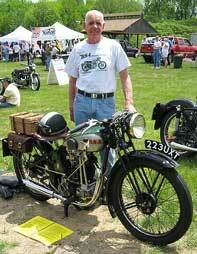 Held in Lancaster, Mass in late May or early June, it's the oldest British Motorcycle Meet in the US. If you need help finding an obscure part or spares manual, want advice for rebuilding a magneto, or simply enjoy the cameraderie of other like-minded BSA riders, we're the club for you. Got a question, need help, or just want to say hello? Contact us at info@bsaocne.org. © BSA Owners' Club of New England Inc. All rights reserved.